Two reasons it may be possible for you to completely ignore your Metro ticket! 2. If your "ticket" does not have the Superior Court's name and address on it, it is a fake ticket (also called a Snitch Ticket) mailed out by Metro in an attempt to bluff you into identifying the driver. 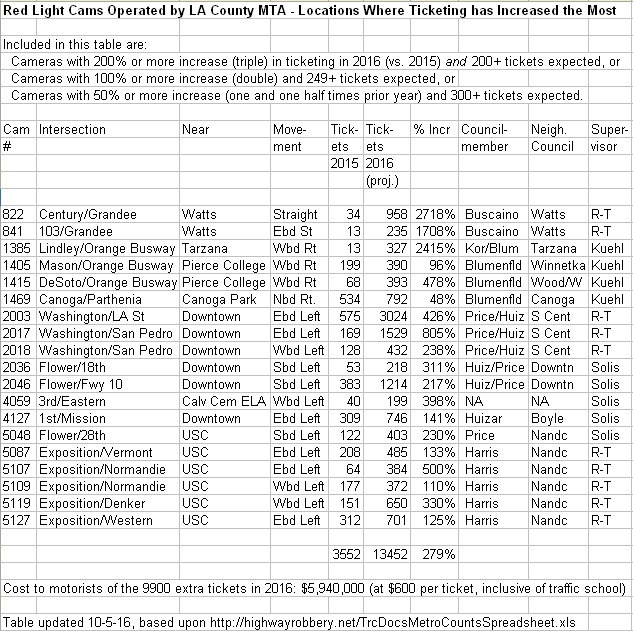 Yes, this is the webpage with a LOT of info about tickets from the red light cameras sited near Metro's busways and light rail lines in LA County. 1. Did they mail your ticket within 11 calendar days of the date of the violation? If it took even one day longer than that, have a look at Defect # 8, on the Home page. 2. If your ticket is for a right turn from northbound Canoga Avenue, please be sure to read Set # 6 below, and contact me. 3. If your ticket is from Century/Grandee, please be sure to read Set # 8 below, and contact me. Metro, also known as the MTA, and formally titled the Los Angeles County Metropolitan Transit Authority, operates bus, subway, and light rail public transit in Los Angeles County. Metro has red light cameras at road crossings along its Orange Line busway in the San Fernando Valley, along the Eastside Gold Line light rail in East LA, along the Blue Line light rail which runs north-south between downtown LA and Long Beach, and along the Expo Line light rail which runs out to West LA and Santa Monica. Metro's cameras are provided by Conduent (formerly Xerox/ACS ). Read Defect # 5 on the Home page. 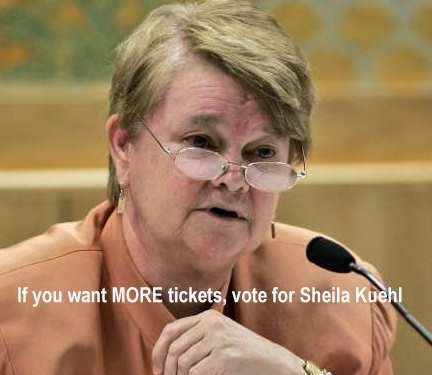 Most tickets are signed by the County Sheriff, and most tickets are prosecuted by the LA City Attorney. 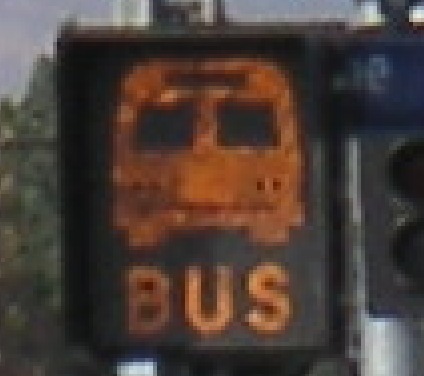 The signals at the busway intersections are usually maintained by the city in which the intersection is located. If you are doing a Public Records Act request for Metro records, the request should be sent to Metro's Records Management Department, at (213) 922-2342, fax (213) 922-2389, rmc (at) metro.net. Metro's main number is (213) 922-2000. However, if you are doing a Public Records Act request for details about the signal lights (signal timing chart, maintenance records) at or near a busway intersection located in the City of Los Angeles, your request should go to the City's Department of Transportation, at: City of Los Angeles, Department of Transportation, 100 S. Main St., 10th Floor, Los Angeles, CA 90012, (213) 972-8470. If you are filing for Discovery, file it with the Los Angeles City Attorney if "your" intersection is in the City of LA. For tickets filed at the Van Nuys courthouse, the address for the LA City Attorney would be: Office of the City Attorney, 6262 Van Nuys Blvd., Suite 160, Van Nuys, CA 91401 Phone (818) 374-3300. If "your" intersection is in an unincorporated area not in the City of LA, your Discovery request should go to the LA County District Attorney, and your Public Records Request for details about the signal lights should go to the LA County Public Works Department. Be sure to read the "Countywide Information," which is Docs Set # 2 on the LA County Documents page. To contact the sheriff who handles the Metro tickets, phone the Traffic Violations Bureau (operated by Conduent) at (877) 786-7234. In early 2012 the MTA sponsored a bill in Sacramento to require LA County judges to issue bench warrants to motorists who do not reply to their MTA/Metro camera tickets. After strong opposition, the bill failed to move ahead. It could come back in a later year, so please phone your legislators and ask them to stop any new edition of AB 2147. More info about the bill is in the "Whom to Believe?" section on highwayrobbery.net's LA County Documents page and in Set # 5, below. At least one Orange Line camera detects an unusual proportion of very long Late Times. I believe that these long Late Times occur because the busway intersections are unusually complex, with several having two or three sets of traffic signals in rapid succession. 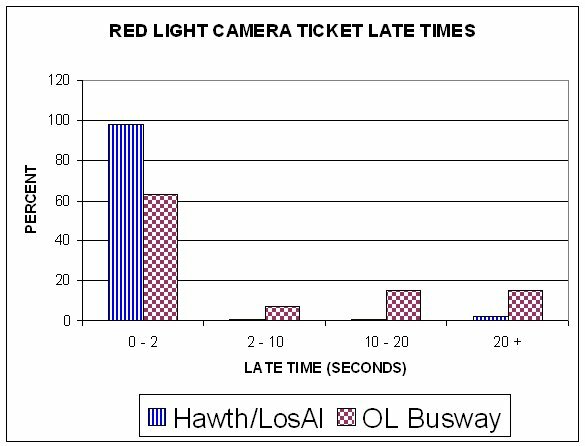 The graph above is from a 2007 comparison of red light camera ticket Late Times at Balboa / busway to Late Times at two large but relatively conventional intersections in other cities (Hawthorne and Los Alamitos). A file containing the raw Late Time data is here. This is the intersection of Reseda Blvd. and the busway. It has three signals in a 250-foot span. For a larger copy of this photo, click here. In Dec. 2009 the Metro Board directed staff to install quadrant gates at 24 intersections along the Gold Line Eastside Extension. 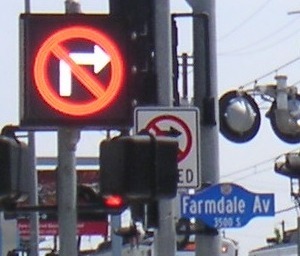 In May 2011 Metro conducted a two-week experiment along the 3rd Street portion of the Extension, adding lighted "no turn" signs, bells, and an all-red signal phase to simulate the effect of gates. So far in 2018, Orange Line ticketing is up 120% (more than double) over the average of 2016 and 2017, and the very heavy ticketing by the seven no-right-turn cameras where the Orange Line parallels Canoga Avenue (see Set # 6, below) is up 28% over the average of 2016 and 2017. If your ticket was at a location where ticketing has recently jumped up, and you think that the intersection is confusing or dangerous, please contact me. The possible refund: See Set # 8, below. 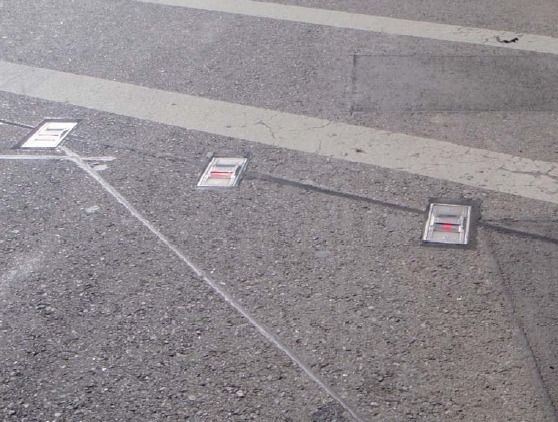 The small table immediately above covers only those cameras which highwayrobbery.net expected would end 2016 with a large increase in tickets issued, compared to 2015. To see the data for those and all other MTA/Metro cameras, click on the link for the Ticket Count Table, above. *Until Feb. 2015 Metro was not able to produce reports for July 2014 or later, and until Feb. 2016 Metro was not able to produce reports for July 2015 or later. **In early 2017 Metro switched to a new format for its official ticketing reports. Those early 2017 (and up-to-May 2018) reports showed that 28 Orange Line cameras were generating a lot of warnings but no citations. In Summer 2018 Metro again switched the format and the resulting official reports (received in Sept. 2018), which re-stated the figures for Jan. - May 2018, showed numerous "citations" generated by the 28 cameras for which the older reports had shown no citations issued, only warnings. Thus it is possible that the "citation" figures in the June 2018 and onward reports may include warning notices. Highwayrobbery.net has requested a new report for 2017. The current contract was signed in June 2014 and extends to June 30, 2022 but can be canceled on 60 days notice, with no penalty (see page 65 of the contract pdf). The contract sets a ticket quota. See page 102 of the contract pdf, this article, and Defect # 9 on the Home/Defects page. Per the contract's Payment Summary (on page 225 of the contract pdf), the total cost of the contract is $19.1 million, which works out to about $1913 per camera per month. Metro agreed to pay way too much. In March 2014 the City of Elk Grove approved a new contract which specified the following schedule of rents for their five cameras. By June 2014, Metro's average camera was more than ten years old, so the target rent, per the Elk Grove schedule (above), should have been $1500 (or less, considering the economies of scale offered by Metro's system, which has 104+ cameras). Metro will pay $4,124,000 extra over the eight years 2014 - 2022 (compared to a $1500 target), and will need to issue an extra 68,733 tickets in order to cover that extra rent (Metro gets about $60 from each ticket issued). To see more about how much other cities pay, see FAQ # 17. In early Jan. 2019 Metro put the contract out to bid. The bid package specifies a term of eight years. Once Metro accepts a bid from one of the bidding camera companies, Metro will be obligated to continue to operate the cameras for the full term - until 2027. The bid package also contains the claim, "the photo enforcement program has resulted in a significant reduction in the number of violations." (Found in the first paragraph on the first page of the 113 page main document. Bench Warrants for Ignored MTA/Metro Tickets? It has been reported that staff in the office of a local councilman, and a reporter for one of the local daily newspapers, have been advising callers and readers that tickets from the red light cameras near the MTA/Metro busways and light rail cannot be ignored - the suggestion being that MTA/Metro tickets are in some way superior to the camera tickets issued by the other agencies and cities in the County - which can be ignored. The best indicator that their advice is not correct is that in 2012 the MTA asked a state legislator to sponsor a bill which would have required the Court to issue bench warrants on ignored MTA/Metro tickets. MTA's official reports of the percentage of tickets paid (available on the MTA Docs page) show why they are so concerned. In late 2014 a new effort began to start a pilot program to give the courts a greater incentive to pursue the collection of fines. That too failed, and was replaced by amnesty programs. The latest amnesty program started Oct. 1, 2015 and ran until Mar. 31, 2017. For more information, see Amnesty in the Site Index. The seven "no right turn on red" cameras installed along Canoga Avenue in Canoga Park (Metro's Orange Line busway runs parallel to Canoga Avenue with a lateral separation of just 50 - 100 feet) have been generating a high proportion of all the tickets in Metro's 100+ camera system. In an early effort to stop those thousands of people from making those dangerous right turns across the busway, Metro installed Blank Out signs which light up when a bus is nearby. They flash this image, supposedly of a bus. 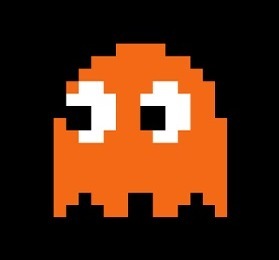 At first glance Metro's sign might be mistaken for Clyde, the ghost from PacMan. In addition to that potential for misidentification, the BUS/PacMan sign presents these other problems. 1. It is an unapproved sign (not listed in CalTrans' MUTCD), thus exposes Metro and the City of LA to liability in the event of an accident. 2. The BUS/PacMan signs depend upon the motorist's understanding of an English word. 3. The BUS/PacMan sign fails to tell the driver what to do, or not to do. A first-time visitor to the area who does not know about the Busway - or that it is nearby - will not know what to do when he first sees the BUS/PacMan sign. What if, in his haste to obey the (brightly and rapidly flashing) sign, he assumes that he is obligated to clear the roadway for an emergency vehicle, and swings a right turn to get off the main road and out of the way? The BUS/PacMan signs have been ineffective against right turns on red - in 2016 and 2017 ticketing by those seven Canoga Avenue cameras was 39% and 41% of all tickets issued by Metro's 100+ camera system. (The official reports of the number of tickets issued are available in Set # 2, above.) 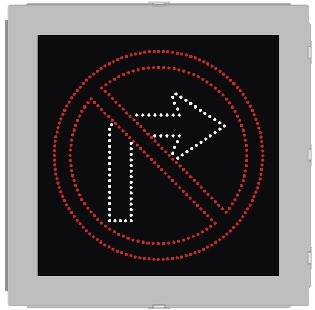 Metro should change the faces of the present BUS signs to display the universal graphic for "no right turn." Metro has installed a number of the "no right turn" Blank Out signs along the Expo Line, in West LA. 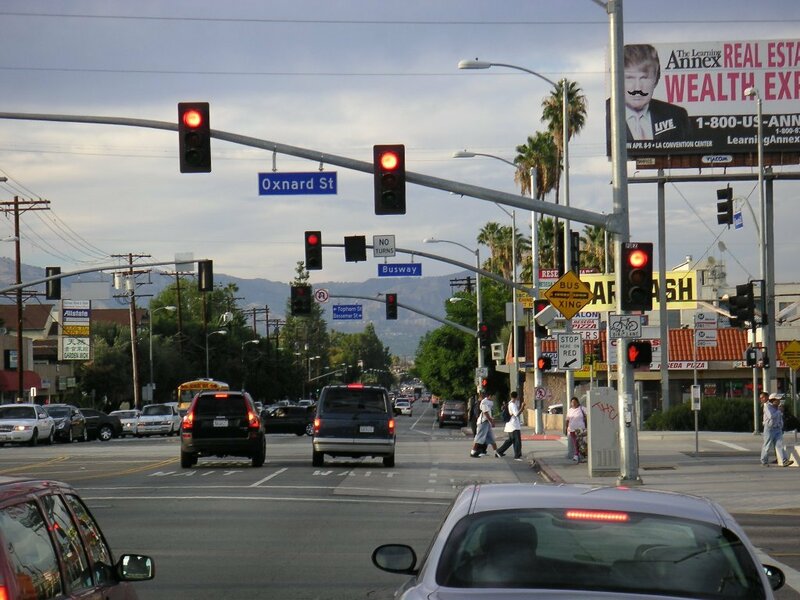 The effect of changing the Blank Out signs along Canoga Avenue to display the "no right turn" graphic would be immediate - a halving, or more, of violations - and it would be quantifiable by the month following the change. Over the years Highwayrobbery.net wrote to Metro a number of times suggesting that the face of the electric signs along Canoga Avenue be changed. In response, in 2015 Metro asked an engineering firm, which was studying how to improve bus speeds along the Orange Line, to also take a look at the sign issue. Here is the engineer's discussion of the electric signs. From page 39 (or page 43 of the pdf) of the final report. In early June 2016 LADOT installed large No Right Turn On Red signs (not electric) along Canoga Avenue, and the figures for June and July (see the spreadsheet linked in Set # 2, above) showed a big drop in ticketing. But in August, ticketing was back up. If your ticket was at a location where ticketing has recently jumped up, and you think that the intersection is dangerous, confusing, or just a ticket trap, please contact me. Metro never filed the official annual reports required by CVC21455.5(i), for calendar years 2013, 2014 and 2015. Finally, in May 2018 they filed reports for calendar years 2016 and 2017. Per those reports, in 2016 90% of the tickets were for turns, while in 2017 56% were for turns - a huge change. On May 11, 2018 we wrote to them. There was no reply so on July 21 we sent Metro a public records request for the source documents. by movement published in those annual reports." since it contains personal citation information." The Trap in Watts - Will There Be Refunds? told CBS2 that wrongfully ticketed drivers should “absolutely” get their money back. "Hundreds of motorists were likely wrongly targeted by cameras at LA intersection." As of 2018 Metro had not announced a refund.